Cordyceps Sinensis (冬虫草）has a long history as a rare and exotic medicinal fungi. It has been a highly regarded cornerstone of Chinese medicine for centuries; one that reportedly has a number of far reaching medicinal effects. Both resilient and rare, Chinese legends and myths of this revered healing mushroom and its chameleonic characteristics span the course of millennia. Cordyceps has always been one of the most expensive medicinal fungi known. Its high price had relegated it almost exclusively to members of the Emperor’s court and others among the Chinese nobility. Historically, it has been beyond the reach of the average Chinese subject. Despite its cost and rarity, the unprecedented litany of medicinal possibilities for Cordyceps spp. has made it a highly valued staple of TCM. Although always a rarity in nature, modern technological advancements in cultivation have made the prospect of affordable Cordyceps a reality, and its potential medicinal uses continue to augment conventional therapy and gain recognition as clinical trials proceed to probe the famed efficacy of the species of the genus Cordyceps. The range of therapeutic uses claimed for the Cordyceps species is far reaching. In TCM, Cordyceps has been used to treat conditions including respiration and pulmonary diseases; renal, liver, and cardiovascular diseases and hyperlipidemia. It is also used in the treatment of immune disorders and as an adjunct to modern cancer therapies (chemotherapy, radiation treatment and surgery). Cordyceps is believed by many, particularly in and around Tibet (its place of origin), to be a remedy for weakness and fatigue, and it is often used as an overall rejuvenator for increased energy while recovering from a serious illness. Many also believe it to be a treatment for impotence, acting as an aphrodisiac in both men and women. 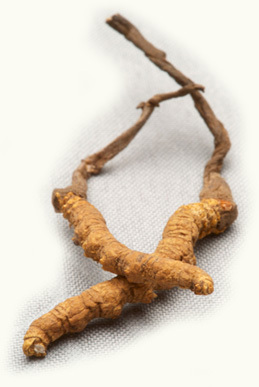 Cordyceps is often prescribed for the elderly to ease general aches and pains. TCM practitioners also recommend the regular use of Cordyceps to strengthen the body’s resistance to infections, such as colds and fl us, and to generally improve the homeostasis of the patient. Traditionally, Cordyceps has most often been used in the treatment of health issues related to or stemming from the kidneys and the lungs. For example, it is used to ease a range of respiratory ailments: cough and phlegm, shortness of breath, bronchial discomfort, chronic obstructive pulmonary disease (COPD), and asthma.